I struggle with decaf, because the world ignores it. They make big, bold regular coffee, and then think that someone looking for decaf is looking for weak coffee. Like that rd stuff to the left… it’s an actual brew of a major brand of decaf, from a decaf k-cup. It even looks like tea! I want good, strong coffee… just without the caffeine. Is that possible? Sure it is. The strength of the coffee comes from the beans and the roast, and the way the ground coffee is brewed. You can make good decaf, just as you can make good regular coffee. And by the way, there is caffeine in decaf coffee. Sometimes a lot! Anyway so this is theBestDecaf and it’s under development… as I go I’ll add more and more REAL factual information about finding good, strong, quality coffee that is decaffeinated. I’m starting with the Keurig K-cup system because that is what I am using now, but the bigger issue is good decaf coffee, in all forms. Drop me a line if you want… I might be slow to work on this hobby site, but I’m around drinking decaf coffee every day! 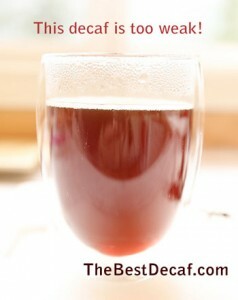 The Best decaf is all about decaf coffee for the Keurig coffee maker (decaf k-cups).